As you are reading this, you must at least be thinking about learning to dive, even if it’s only one of those “I’ve always wondered what it’s like to breathe underwater” daydreams. Well now’s your chance to find out! The first step is to attend a ‘Try Dive’ session. The session is taken by one of our qualified and experienced BSAC instructors. First they will show you the basic scuba equipment and how to use it. Then it’s into the pool to show you how to breathe and move about under water. We provide all the equipment – all you need to bring is a swimming costume and a T-shirt or similar. You will also be given a talk about our club and the training we offer. 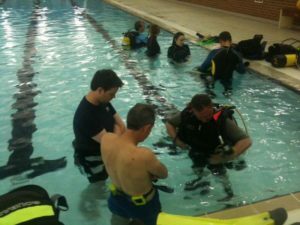 Try Dive sessions are run on a regular basis, and cost £15. In addition there is a £5 pool fee for the Palatine pool. Please note that you will be asked to sign a medical self-declaration to confirm that you have no known significant medical problems (especially heart conditions, serious ear or sinus problems, lung damage, fits or epilepsy, and some forms of asthma). Unfortunately, whilst we can do ‘try dives’ for 8 year olds and upward, there is a minimum age limit of 12 for those wishing to learn to dive. If under 18 a parent or guardian must be present during all training and present on dive trips. Each try-dive is about 1 hour in duration, including poolside tuition on the diving techniques and the equipment. A Try-Dive can help you save time and money by finding out in advance if you like diving (or snorkelling). It allows you the chance to sample an exciting sport and to gain an insight into the fascinating world beneath the waves.